Last year had a wide variety of splashy celebrity weddings—and quite a few bold choices when it came to wedding décor, dresses, makeup, and more. Read below to learn about some of our favorite things that these newlyweds did for their big day, and maybe get inspired to make some bold choices of your own! One of 2017’s biggest, most talked-about celebrity weddings was that of Princess Kate’s younger sister, Pippa Middleton, and financier James Matthews in May. 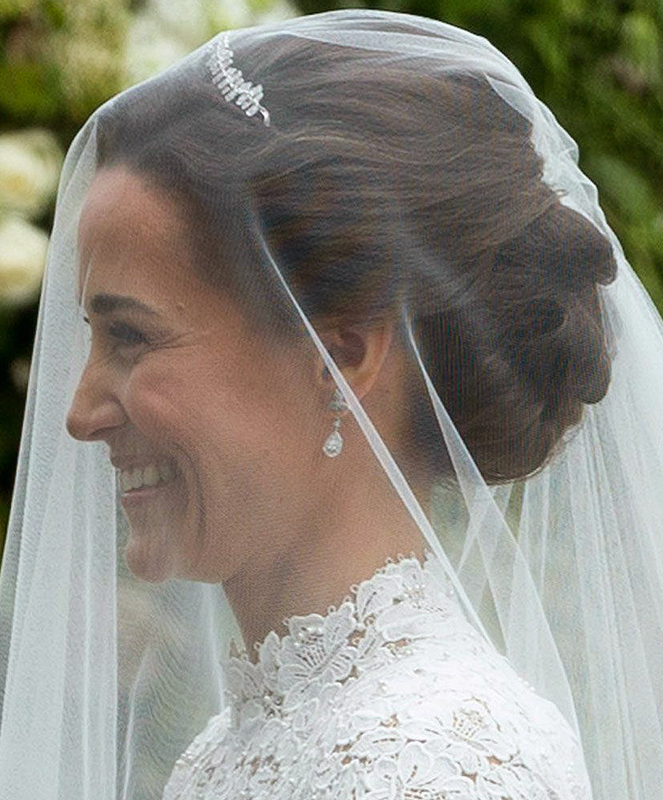 For her hair, Pippa opted to go with a sleek updo, an understated yet sparkle-filled tiara, and a classic veil. This stylish grouping of simple choices worked together to create a fresh and elegant look. 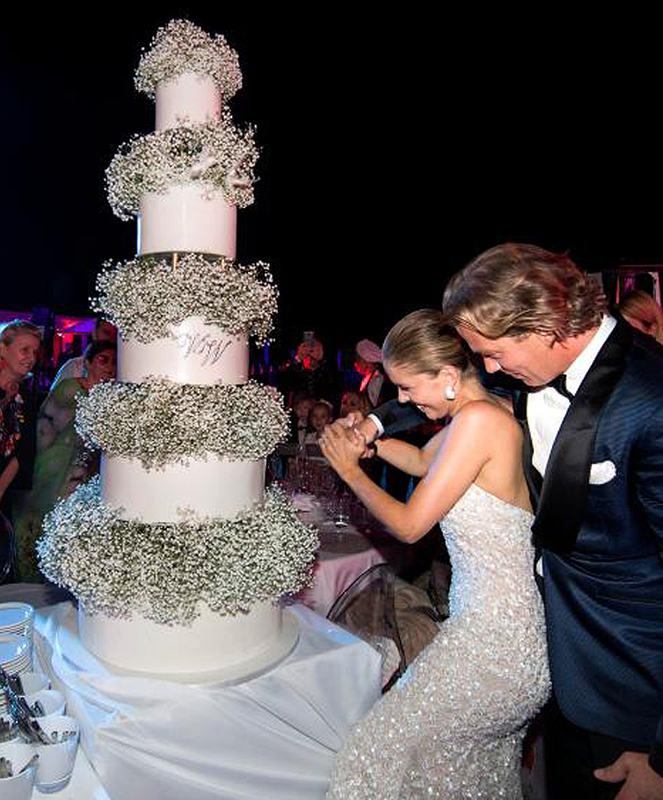 Victoria Swarovski’s custom-made gown may have been worth more than $1 million and had 500,000 crystals—but just as stunning was the choice to tie everything together (bouquet, cake, décor) with simple baby’s breath flowers. This May 2017 wedding was nothing short of extraordinary. 2017 saw former Bachelorette star Ali Fedotowsky and her fiancé Kevin Manno join together as a married couple in early March at the Terranea Resort in Los Angeles. And who was the first of the bridal party to make their way down the aisle? The couple’s dog, Owen. 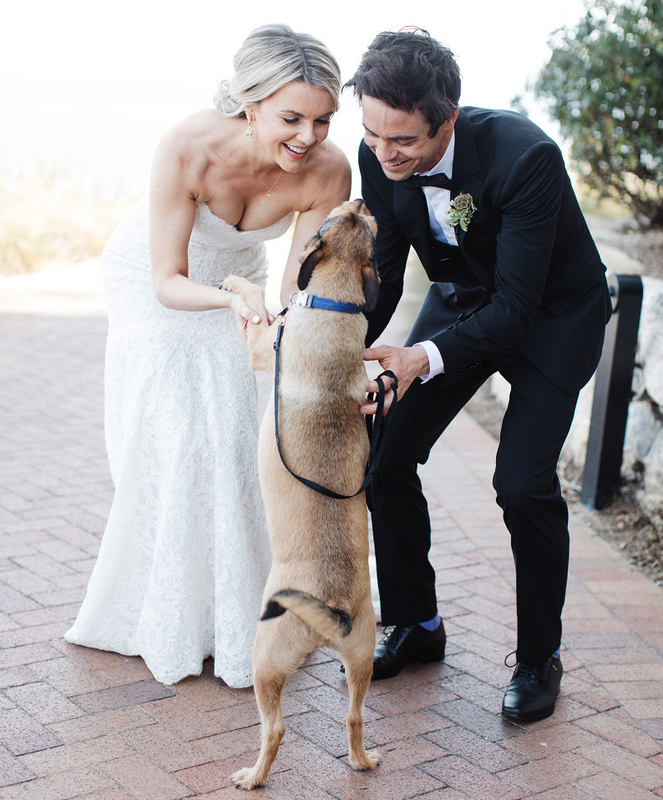 If you share a dog as a couple and feel that it’s important to include your furry friend in your ceremony, go for it like these two did! Just days after Justin Verlander lead the Houston Astros to victory in the World Series, he and model/actress Kate Upton joined together as one at the Rosewood Castiglion Del Bosco resort in Tuscany. 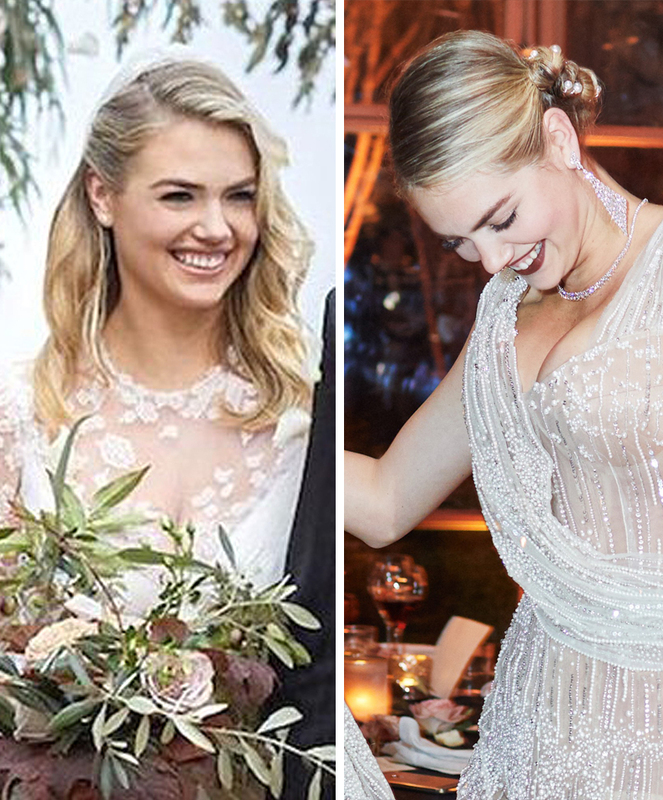 Not only did Kate rock three different wedding ensembles—she also decided to go with two different makeup looks: one for the ceremony, and another for the reception. Her makeup choice for the ceremony was more natural and virginal, while her reception makeup style was bolder and more suited toward the evening. This ceremony-to-reception makeup change is a popular choice for brides who particularly love makeup! In November 2017, tennis star Serena Williams and her now-husband Alexis Ohanian, who is a Reddit co-founder, married in New Orleans. Serena looked absolutely gorgeous in her Sarah Burton-designed wedding dress—especially her fairy-tale like bridal cape. 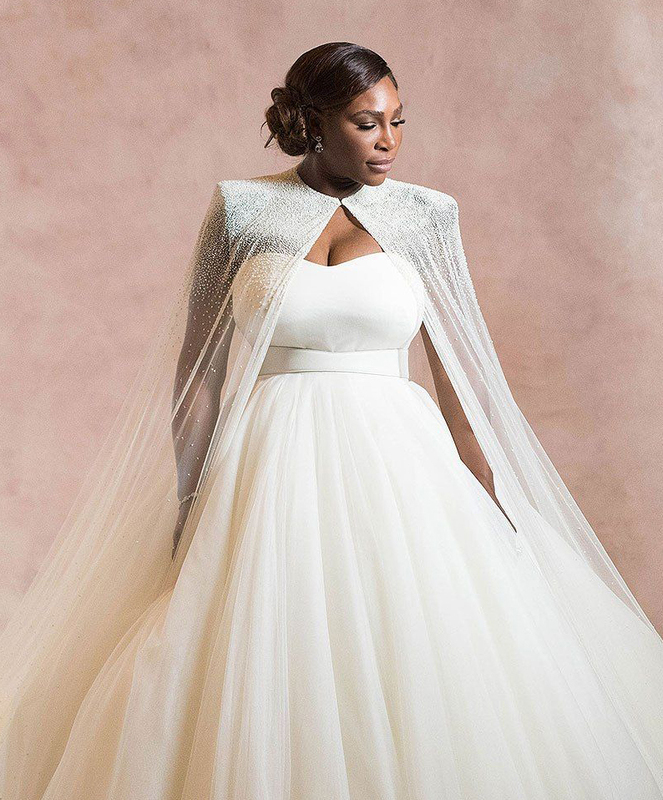 “I felt like a princess and Superwoman all at once,” Serena said of the now-iconic cape, which paired perfectly with the floating layers of the gown. Oscar-winning actress Jessica Chastain married her fiancé, Italian count Gian Luca Passi de Preposulo in June 2017 in Italy, at one of the year’s most star-studded celebrity weddings. While Jessica’s gorgeously simple Alexander McQueen wedding dress was very chic, it was her siren-red rehearsal dinner dress that really stands out. She wore the embellished red dress with Christian Louboutins, creating a fabulous pre-wedding look. Take note: bright minis make excellent rehearsal dinner dresses! 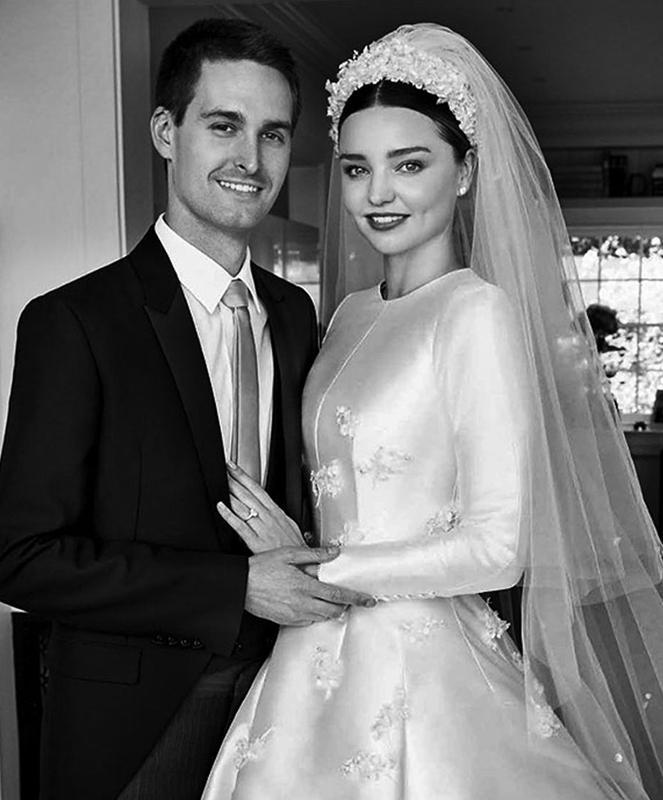 Although Miranda Kerr and Evan Spiegel’s wedding was small and intimate for a celebrity wedding, the ceremony was lavish nonetheless. Her entire gown (designed by Maria Grazia Chiuri for Dior) echoed Grace Kelly’s classic 1956 dress, with the focal point being her stunningly beautiful headpiece and veil. It was sweet, timeless, and perfectly fit Miranda’s angelic face. Inspiring, right? If you’re currently planning a wedding of your own, why not try some of these fantastic ideas from some of our favorite celebrities? And if you’re looking for a beautiful Los Angeles wedding venue, check out our gallery at Blush Banquet Hall! We host extraordinary weddings, and we look forward to answering any questions you may have. Simply contact us to learn more!